The project involved a number of discreet aspects. The overall project brief was to transform the previous offices into a new, modern and functional office for APG. 1. Internal demolition and refurbishment / fit out of office areas including the creation of 2 receptions, staff hub and generally a mix of open plan and closed office spaces. 2. The upgrade of base building services to accommodate the new businesses including electrical and communication upgrades. 3. An overall façade upgrade / modification including repainting, new louvered elevation, signage elements and landscaping works. 4. A 120m² balcony extension. There were an array of finishes used and applied to the works. 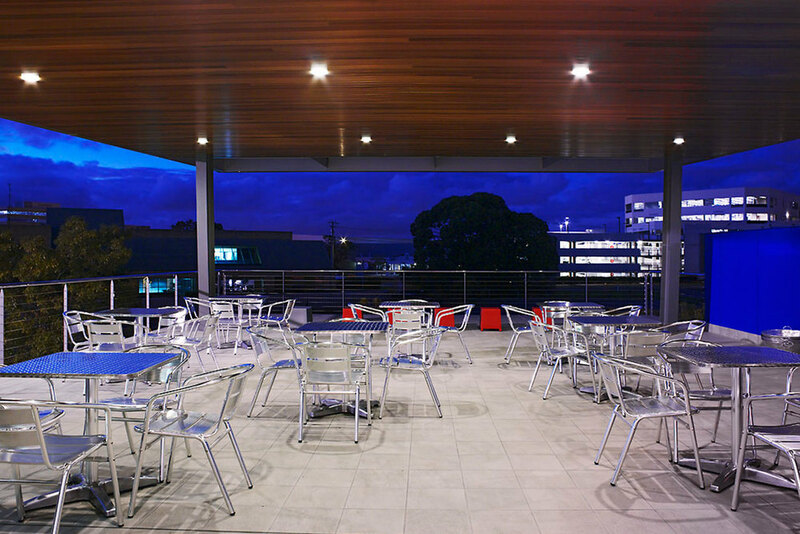 Externally the use of textured paints, alpolic, anodized aluminium blades, precast concrete, and western red cedar balcony soffit linings provide a transformed and modern aesthetic. Internally the fit out comprises both internal office areas constructed of plasterboard and glass partitions and open plan workstations comprising powder coat aluminium workstation screening, individual personal storage units, tambour storage units and new carpet tiling throughout.